Jeff’s Gourmet Sausage Factory – O Hei There! As part of my self-serving lunch section of the blog (since I’m really doing it to create more lunch options for myself), I polled a dozen of my coworkers on what their top 5 lunch spots were. I’ve been to most of their choices, or am fairly indifferent about the ones I haven’t been. 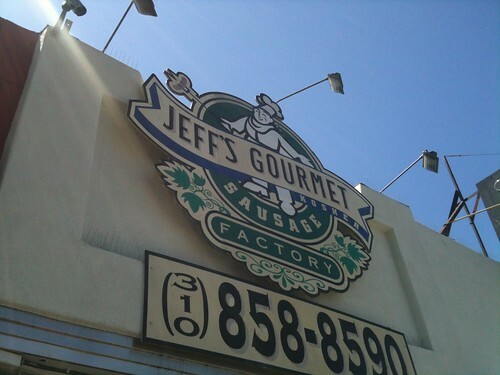 But one choice, by coworker Melody, caught my attention immediately: Jeff’s Gourmet Sausage Factory. She really recommended the place for their burgers, but I remembered reading about Jeff’s Gourmet re: the Kosher Corridor in LA Weekly, as well as the publication’s top 10 best hot dogs list (at #7). So last Thursday, I decided to give the place a go. Determined to be a kosher fatty, I ordered an old-fashioned and a regular hot dog with grilled onions. First of all, the hot dog, while fairly standard, was pretty damn good. Jeff’s makes all of their hot dogs and sausages in-house, as well as cures and seasons their deli meats as well. In this case, the house-made aspect was evident – the hot dog had a cleaner taste than the street hot dogs I’m more accustomed to. But I didn’t write 300+ words so far to talk about the hot dog. It’s all about the old-fashioned here. 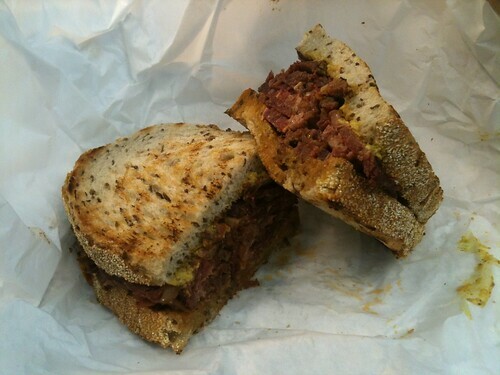 The sandwich was old-fashioned indeed: thick-cut pastrami slices with deli mustard on rye bread. It’s very easy to hear that and immediately discredit it as some cheap imitation of the legendary version that can be found at Langer’s (and understandably so). But while Langer’s has essentially perfected the execution of the cured and seasoned pastrami, Jeff’s takes a (literally) sloppier approach. The beautiful slices of pastrami are unapologetic-ally bursting with fat, loaded with enough juice to soak the toasted rye bread as if it was dipped a la Philippes. You pick up alternating hints of garlic and smoky flavors with each enormous bite, but the star is that fat. Kosher pork belly, if you will. It’s not the cheapest of options at $15/sandwich, but such delicacy transcends a moot price point. I will definitely be back to try other items on their extensive menu (the boerewors sausage and the western burger in particular), but if that old-fashioned is there on the specials board, it’ll be might hard to say anything but l’chaim and submit to the Old Testament. In my search for a greater purpose in life at lunchtime during work hours, I have finally found my calling. The Old Fashioned Pastrami Special ($14.95) – a ½ pound of hand-carved garlicky pastrami on crusty rye bread with deli mustard. Served with cole slaw and a pickle.